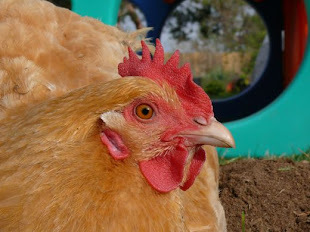 Chicken Blog: From The Stash :: What Do You Think? 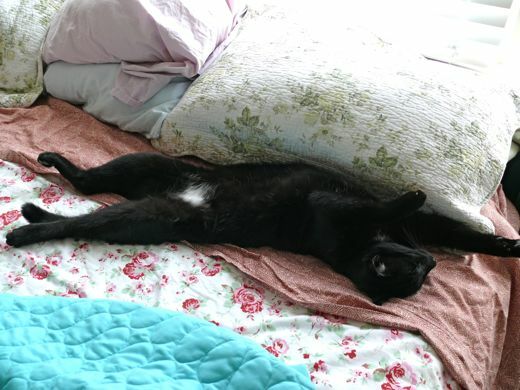 For The Record: Chango loves our bed just as it is. He is not particular. Geoff, likely, is also not particular. Back Story: In 2001 I bought the first bed covering for our bed since the comforter Grandma Nancy gave us as a wedding gift. 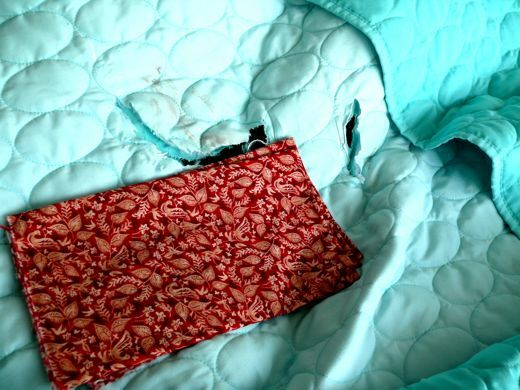 The wedding comforter is still around, but somebody should take mercy on it and give it a proper burial. 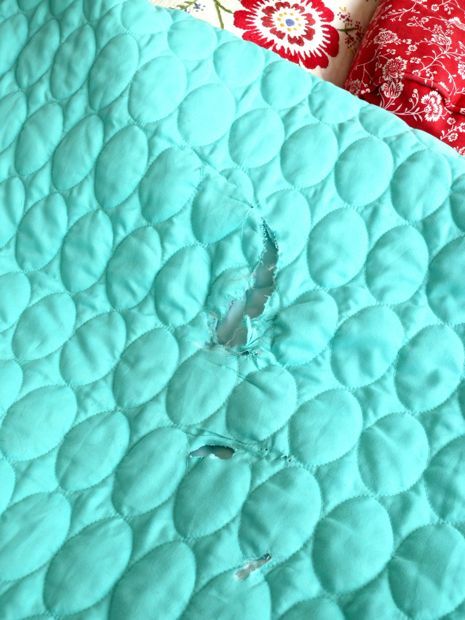 The quilt I bought almost eleven years ago is still beautiful, but its days are numbered... it is fraying all over. 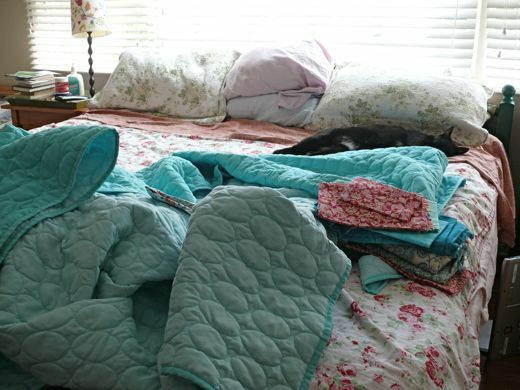 I put the quilt in the closet for summer, since it is heavy, and also to prolong its life. Very recently I spent big money (29$) at Target and brought home a summer weight bed cover. 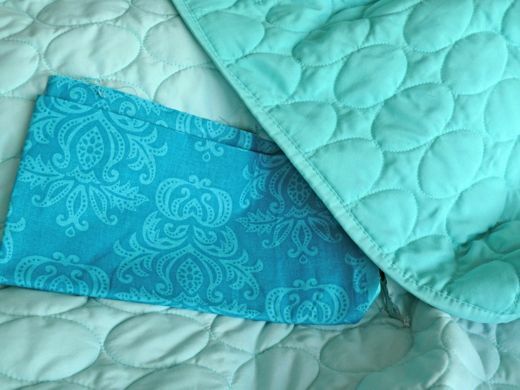 It has two tones of aqua blue and a simple egg-shaped quilted pattern. I love it. It doesn't really go with anything else on the bed, or in the room, but that is typical of everything in the room and on the bed, so there you go. 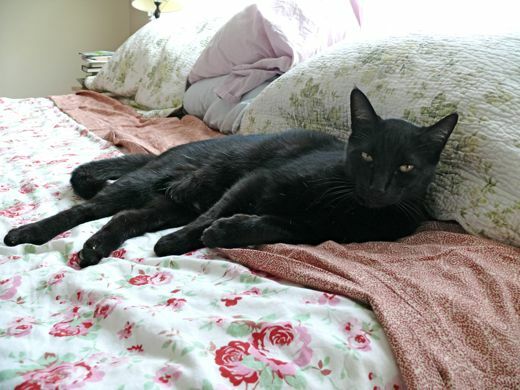 Chango is resting against the thrift shop shams, and across the thrift shop duvet. Love the duvet, which is really too small for our bed, but is too cheery to resist. The sheets are not my best buy. They are almost too dark, too serious. I settled for them in desperation, and hoped they would make me sophisticated. I am not sure anything will ever make me "sophisticated." Ready for the Pity Party portion of this post? 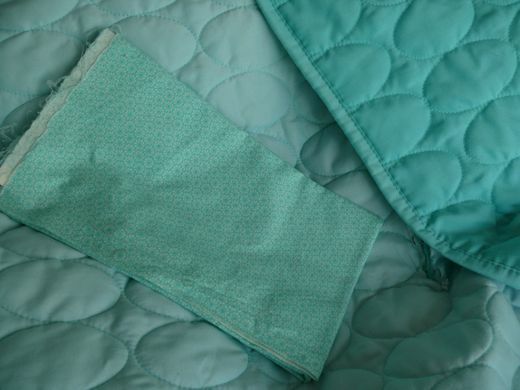 Only two weeks old, and the bed cover came out of the washing machine seriously damaged. Seriously: What in the world goes on in that washer? And why am I still using the darn thing? Could I-Should I patch it? Okay, maybe it won't be classy enough for a bed, but it would preserve it for picnics, camping, spreading on the lawn activities. And honestly, I would still put it on my bed, I think. It could look good. This I am prepared to veto outright, but it's there for general contemplation. In real life the blues are not quite a match, but overall it's a pleasant combination. I like keeping it cool. Cool, yes, but maybe too blue? Now, this is the best color match, working with what I have on hand, but it's kind of eh. Or maybe, not? I often admire subtle and yes, sophisticated, but I usually fail to achieve the look of subtle and sophisticated... S&S Oh, but wait I am talking about patching a cheap bed cover, so I think I have already tossed out all hope of S&S. So, moving away from subtle, I thought: Color! I love this print. Is love a good enough reason to execute a plan? Either I go subtle and sort of be on the down low about patching the hole, or I declare it boldly: This is a patch. Bright and beautiful. Isn't it interesting? Yeah, not sure which way I am going. Possibilities. I have enough to make a pillow, maybe a throw quilt. Chango, what do you think? Oh dear. I guess I cannot expect everyone to find this as interesting a debate as I do. Like I said: I am not concerned with "matching" anything in the room. Our budget style has always been Ethnic-American Eclectic... very cutting edge. 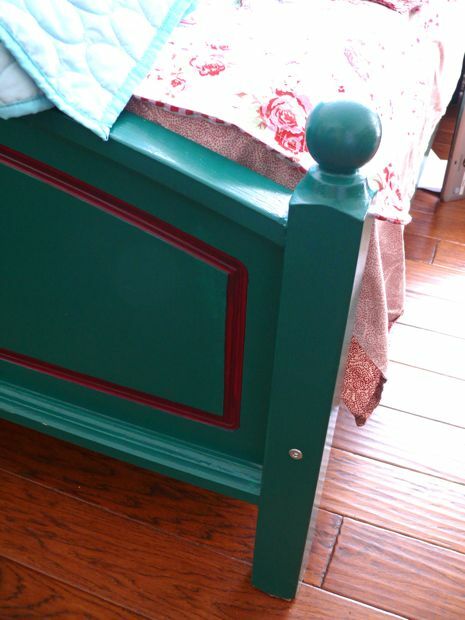 It has taken me four years to post this picture of the green bed. Either the color and super sheen have calmed over time, or my senses have deadened. I was going to say our look is Mix-n-Match, but I think it's more like: Mix and Mix and Mix, and maybe something good will come of it. My half a cent? I like all the blues and would cut out larger shape ovals (same as the stitching) and just make different sizes of patches. Scattered about. 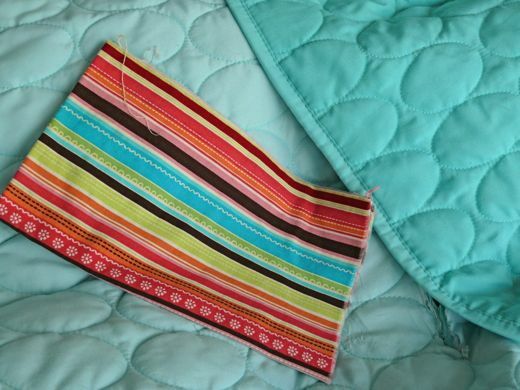 Then make a couple of pillow cases with the rest of the scraps. Neat cover. I like the color. You're right. I should spread out... not just cover the hole. I like this. Oval shaped... good idea. And yeah, I am definitely leaning with the blues. I like Tara's idea a lot! 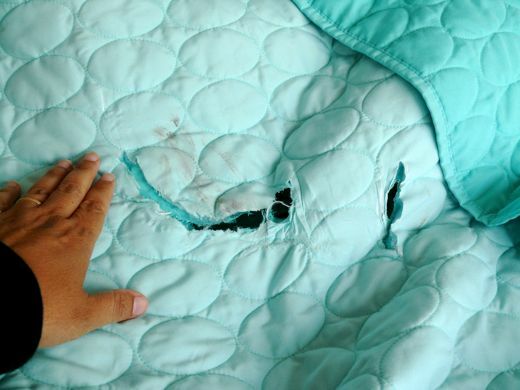 I was thinking with all your skill that I've observed reading this blog, patching up a comforter would be right up your alley! : ) And just for the record - I like your style, whatever you want to call it! I reckon your room looks really homely and welcoming - perfect look for a bedroom. 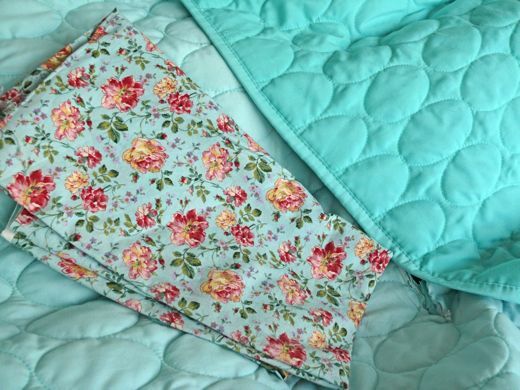 If I had the ripped blue quilt, I'd cut it up into large sections, cutting close to and getting rid of the ripped bit, and then piece it together again, with a new border made from one of your colourful stash fabrics. Cutting it into just six, or even eight sections, could do the trick. Then you could piece it back together with the eggs running in both directions, which would break up the overall regularity. 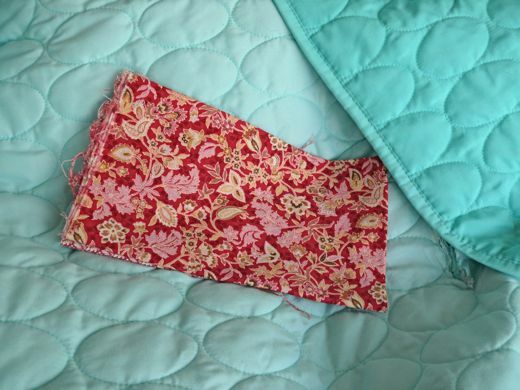 If the look of the seams on the reverse upsets you, you could back it and machine stitch over some of the egg shapes to make sure the back is well attached. I don't think you can beat the combination of aqua, white and pinky red. But patching it is also an option! I like the combination you put together at the end! 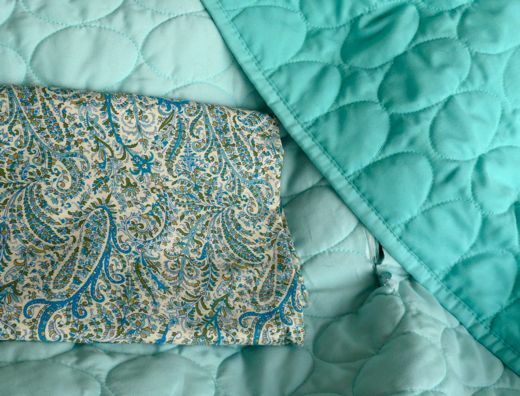 I love the blue paisley. 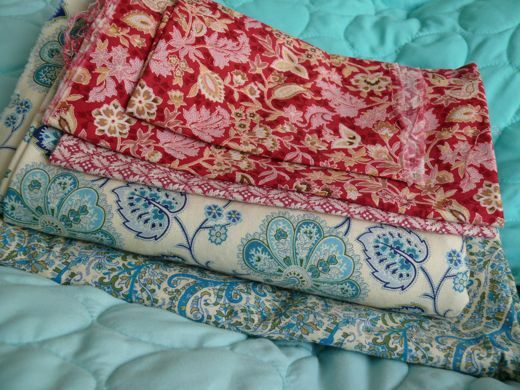 I have had a thing for paisley since the 60! I would veto the first one, too. Nice comments and feedback. Thank you so much. It is helping me see that I might actually be on a good course. I was at Costco, and they had gorgeous bedcovers... king size for less than 30$, which is crazy... I can't decide if it is better to spend time or money, know what I mean? Both are valuable. I am so unskilled in the sewing/decorating department I hesitate to offer any opinion - but I really like the fabric with the blue background and the pink flowers. Yes Natalie, you "could" buy a new bed cover. But would you have as much fun? Or better still buy the new one, and stil fix the other one.Then you will have a change of decor on hand :). If you decide to "fix" it. I like the idea of the reconstruction. More work but how pretty it would be. I love the colors. Any thing aqua/blue and red is ok by me. I like all your choices so you can't go wrong there. 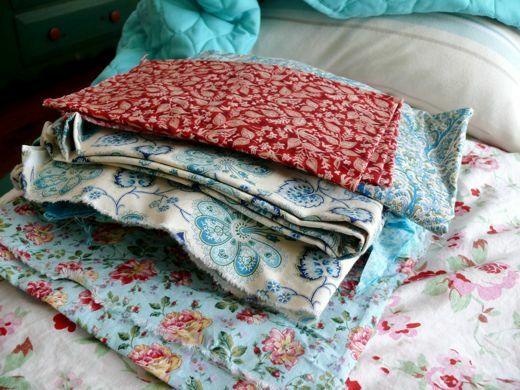 Recently I purchased some fabric for a table cloth at a second hand store. I found out it was a shower curtin on closer inspection. It's been re purposed and is just fine with some "adjustments"
wow. i love the colors you choosen. expecially the combintation of blue and red .. not so much the blue on blue. a think a patchwork of sorta could be really beautiful! good luck. hope to see what you decided.